These days you are spoiled for choice when it comes to picking a robo-advisor who can manage your money automatically. You don’t need to lift a finger any more because all the hard work of portfolio selection is done for you. But what if you want more than a computer algorithm to work on your behalf to invest your money? When the market falls or you have a query about your investments, would you like to pick up the phone to speak with a dedicated financial advisor? If so, this Personal Capital review is written for you, the person who wants the best of both worlds: the power of computer algorithms to build customized portfolios to match your risk tolerance and financial goals and human advice on demand. Personal Capital is unabashedly the white-glove robo-advisor with superior customer service. Unlike most robo-advisors, who rely solely on computer algorithms to invest money or connect clients to teams of live advisors, Personal Capital offers a more personal touch beyond simple robo-investing. When you invest with Personal Capital, you will be assigned a dedicated financial advisor. Invest more than $200,000 and you will be assigned two dedicated financial advisors. When markets tumble or you simply have queries about whether you are on track to reach your retirement objectives, dedicated advisors are available by phone or email. As you might expect from a service that pairs you with a dedicated financial advisor who has in depth knowledge of your personal circumstances, pricing and account minimums are higher than at rivals like Betterment and Ellevest. 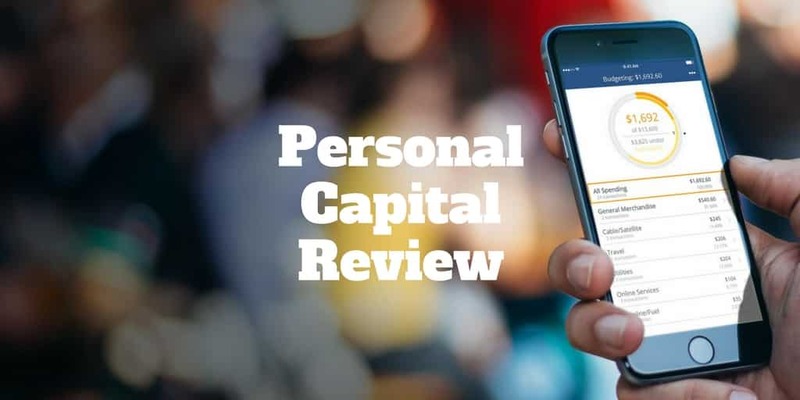 Even if you don’t qualify for investment management services, you can still download the free Personal Capital app. It ranks among the very best personal finance apps and helps you to easily track income, spending, and net worth. If you want the best of both worlds: automated investment management plus human advisors who know your financial situation intimately, Personal Capital is virtually unmatched. Personal Capital is not for everyone. This service requires minimum assets of $100,000 and comes with hefty account maintenance fees. But if you’re a higher-end investor who prefers a human touch, personal capital might be just what you need. Clients must deposit at least $100K in order to open an account. Once your account is set-up, Personal Capital assigns you a dedicated advisor who will help you make investment decisions so that you have the best chances of making your investment grow. If you fall into the bracket of higher net worth individuals who can deposit $200,000 or more then you will be paired with not one but two dedicated financial advisors who can be contacted by phone, email, or even video chat. If your assets are under $1M, you’ll be assessed a fee of .89% a year. This fee goes down as your assets grow, but even for smaller accounts it is below the market rate charged by most traditional advisors. Personal Capital recently began offering a new service: socially conscious investing. It labels this method the Socially Responsible Personal Strategy, and is a good fit for clients who care about the effects of say oil drilling, sugar consumption, environmental destruction, and other hot topics. This service allows investors to choose companies that support shared values and avoid investing in companies whose values do not align with their beliefs. If the idea of staying glued to your computer screen all day watching each tick of each stock or exchange-traded fund you own doesn’t appeal to you, Personal Capital is likely a good fit. You don’t have to get involved in portfolio selection or weightings because Personal Capital makes the decisions for you about what percentage of stocks vs bonds to hold. Plus, it scrutinizes the costs of investment expense ratios to ensure you are not being stung with high fees. In essence, you can sit back and relax confident in the knowledge that your portfolio will be invested intelligently and cost-efficiently. Investors with large portfolios and more complicated financial situations are a good fit for Personal Capital. Unlike some other robo-advisors who are content to serve customers with straightforward financial circumstances, Personal Capital won’t be intimidated if you need help with a taxable account, a trust, and an IRA. Of course, a client with just a standard account managed will be served equally well. Personal Capital makes budgeting and asset tracking tools available for free, and the service comes with automatic portfolio rebalancing, tax loss harvesting, and the opportunity to get advice about your 401k and 529 accounts even though they are not directly serviced by Personal Capital. While Personal Capital is designed for investors who don’t want to actively invest their own money, it is a constant source of research for inquisitive minds. Whitepapers on topics like estate planning, legacy planning, and building wealth are regularly featured free of charge. When you invest up to $1,000,000, you will be charged a management fee of 0.89%. For example, a client investing $100,000 would pay $890 per year. For investors with larger account sizes, fee breaks are offered and drop as low as 0.49% for “whales” who invest $10,000,000 or more. Personal Capital incorporates the research of Nobel Prize Winner in Economics, Harry Markowitz, and behavioral finance expert, Shlomo Benartzi, to create an asset allocation formula called Smart IndexingTM that is designed to boost returns and lower risk compared to the S&P 500. The investment method is designed to increase returns and lower risk by allocating equally to all sectors, as opposed to mirroring the S&P 500. In back-tested studies, the results show returns outperformed by 1.5% annually using Smart IndexingTM and reduced volatility compared to investing only in the S&P 500. The weighted average expense ratio of a portfolio of exchange-traded funds in which assets are invested is a very reasonable 0.09%. For parents, the Personal Capital Education Planner is a valuable forecasting tool. It estimates how likely it is that parents or guardians will meet their goals to finance the college tuition of a child. Enter the length of time you expect your child or beneficiary to attend college, and specify how much you would like to spend. Personal Capital algorithms will then get to work and project how likely it is that you will meet your financial goals. Like its arch-rival, Betterment, Personal Capital has added socially responsible portfolios to its lineup of products. The Socially Responsible Personal Strategy® enables customers to invest in companies that make them feel good about where their money is allocated. For investors who care about environmental, social, and governance factors (“ESG”), and the sustainability practices of companies, Personal Capital now makes it easy to align investments with personal values. ESG and sustainability data comes from Sustainalytics, a global leader in ESG and corporate governance research so you can have confidence in the integrity of the strategy. If you elect a Socially Responsible Personal Strategy, the same features apply to your portfolio as with core portfolios, including exposure to all six major asset classes. It also features Personal Capita’s proprietary Smart WeightingTM methodology to balance exposure to style, size, and sectors within U.S. equity asset classes. Personal Capital sets itself apart from other robo-advisors by connecting clients enrolled in its advisory service to human financial advisors. ✅ White-Glove Investment Service: Personal Capital pairs each client with a dedicated human financial advisor who is accessible by email, phone and even video chat. When you invest $200,000 or more, you are assigned two dedicated financial advisors. ❌ High Account Minimums: To get started with the Personal Capital investment management service you will need to pony up a minimum of $100,000. ✅ Reasonable Fees: Clients with under $1,000,000 in assets under management pay 0.89% which is higher than some robo-advisor rivals but significantly lower than traditional advisors who typically charge north of 1%. ❌ Soft-Sell: When you sign up to the free mobile app, you will be invited to speak with a financial advisor if you have enough money. We found the process to be a soft-sell and not intrusive. ✅ Excellent Support: The customer experience is second to none thanks to dedicated human financial advisors who may be contacted via phone and email, as well as video chat. Clients with $200,000 or more invested are assigned a second dedicated financial advisor. ❌ Standardized Asset Allocation Models: You are restricted from customizing your asset allocation because standardized models are used. ✅ Free Mobile App & Tools: The Personal Capital app is about as good as it gets when it comes to tracking spending, income, and net worth. ✅ Easy To Use: The user experience is about as intuitive as any online financial tool or robo-advisor service. ✅ Investment Tracking & Reporting: It is simple and fast to “look under the hood” of your portfolio and spot which assets are performing well or poorly. ✅ iOS & Android Compatible: Whether Mac, PC, iPad, iPhone, iWatch or Android device, Personal Capital syncs with them all. ✅ You Index: With the You Index, you can compare how your portfolios are performing compared to standard benchmarks like the S&P 500. ✅ Complete Financial Insights: Unlike some tools which help you track your investments or others which are good for day-to-day budgeting, Personal Capital provides full insights into your overall financial situation. Personal Capital charges higher fees than pure robo-advisors who offer no human advice but less than the average human financial advisor. Personal Capital will manage the following accounts and will advise on accounts that it will not manage, such as 401(k)s and 529 Plans. Personal Capital allocates assets across taxable and tax-advantaged accounts to optimize for tax consequences. Users are required to register each device when logging on. We found that even after registering a computer, Personal Capital looks to validate a user who moves to a different IP address. For example, if you navigate to the Personal Capital login from a local coffee shop, your identify will be validated again. All your information is stored as read-only, meaning that even if someone gets a hold of your mobile device and somehow gets past your pin code or fingerprint scanner on iOS devices, they still cannot transfer money from within the Personal Capital app. The only way Personal Capital could heighten its security is by adding two-factor authentication, which is standard on cryptocurrency digital exchanges, which store your money. But because your money cannot be accessed via the Personal Capital app, two factor authentication is not as big a concern. Personal Capital is designed for higher net worth, fee-conscious investors capable of meeting the $100,000 account minimum. Is you wish to avoid the higher fees associated with human financial advisors yet still want to have contact on-demand with a dedicated financial advisor, Personal Capital is your best option. 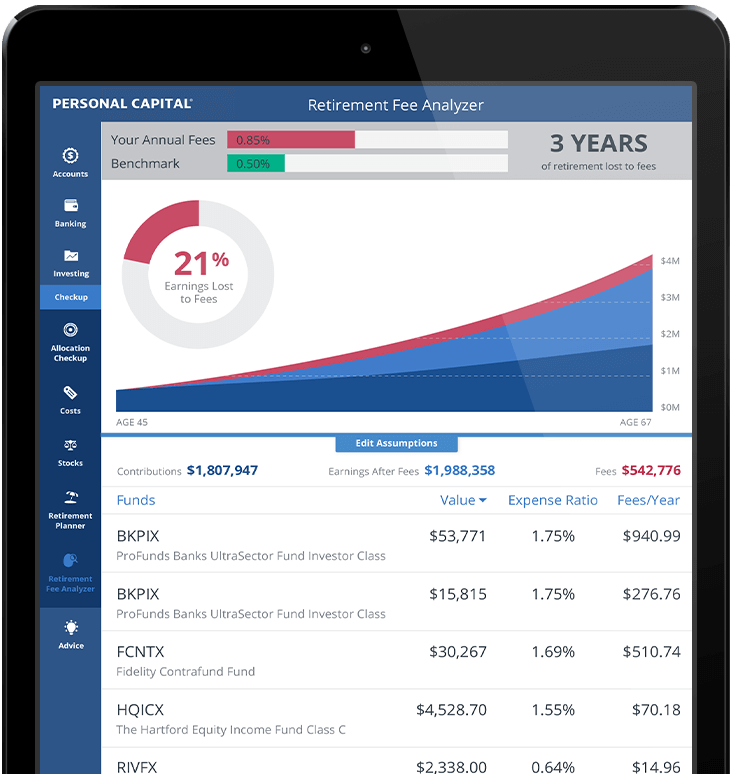 For those who can’t meet the account minimum, Personal Capital offers an excellent mobile app complete with great tools to evaluate spending habits, recommend asset allocation improvements, and visualize retirement goals. Few robo-advisors provide the white-glove service offered by Personal Capital. Even those that offer human advice tend not to pair clients with dedicated financial advisors. So the bottom line is you are looking for a top tier service that combines automated investment management with a personal touch, Personal Capital likely has everything you need and then some. Still not sure? Check out our Personal Capital vs Betterment review. In addition to its investment management services, the free Personal Capital mobile app is available to anyone. You can download the app from the App Store if you have an iPhone or iPad, or the Google Play store if you have an Android device. The app syncs with your bank accounts, credit cards, brokerage accounts and other investment accounts so you can easily track travel, entertainment, taxes, loans, personal care, clothing, groceries, and so on. You can use it monitor spending habits but it’s more than a simple budgeting app because it tracks your assets, liabilities, and net worth too. For fee-conscious investors, the Retirement Fee Analyzer is an excellent tool to help you identify at a glance how much of your money is being lost on pesky fees charged by funds. It will also inform you how much to modify each asset class holding to match your recommended targets. And it provides retirement forecasts so you can see what needs to be done to hit your retirement income goals.